Credit for this recipe goes to http://www.edibleperspective.com/. 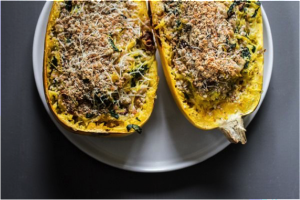 Slice spaghetti squash lengthwise and scrape out seeds. Drizzle with oil, a sprinkle of salt + pepper and then rub in. Line 1-2 baking sheets with parchment paper and place squash cut side down. Bake for about 35-40 minutes until just tender enough that you can scrape the squash into strands. You don’t want it fully cooked since it will be baked again. While cooking, place bread in a blender or food processor and grind into breadcrumbs. Toast on a pan in the oven [top rack is fine] for about 6-8 minutes. Remove and let cool fully, then toss with oregano and Parmesan. Flip the cooked squash halves over and let cool for 15 minutes (longer is fine). While cooling, heat a large sauté pan over medium-low heat. Add 2 teaspoons of oil. Once hot, add the shallot and let cook for 3-4 minutes, stirring frequently. Add garlic with 1 teaspoon of oil and stir frequently for about 2-3 minutes, until lightly browned. Preheat oven to 350° F.
Raise the pan heat to medium. Add white beans and a hefty sprinkle of salt + pepper. Cook for 4-5 minutes, stirring occasionally. Stir in sun-dried tomatoes and let cook for about 2 minutes. Stir in kale and oregano. Let cook for 1-2 minutes until just starting to wilt. Remove mixture from the heat. Scrape about 90% of the spaghetti squash into a large mixing bowl, leaving some attached to each shell. Empty the kale mixture over the squash and combine. Add salt and pepper until seasoned to your liking. Whisk the egg in a small mixing bowl. Mix in the ricotta, Parmesan, a pinch of salt, and about 1/4 teaspoon black pepper until. Empty over the squash mixture and toss with your hands to evenly distribute. Scoop 1/4 of the mixture into each squash shell. Do not pack in. Bake for 25 minutes, until the top layer is a lightly crisped and brown. Sprinkle with toasted breadcrumb mixture and bake for another 5-8 minutes. Remove and let cool slightly, then serve.